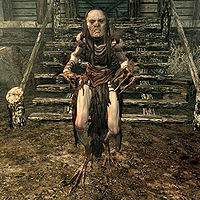 Moira is an originally non-hostile hagraven inhabiting Witchmist Grove. She does not appear before the related quest begins, but will remain alive if you avoid confronting her. She will become hostile through dialogue, and when defeated, you will find the quest item "wedding ring" in her inventory. This page was last modified on 3 May 2017, at 12:17.